Imagine a rocky road on which you bump along as the car goes slowly, trying to negotiate it's way carefully. You clutch the steering wheel tightly and proceed, cautiously. Yet every time the car hits a jutting rock, you bounce in it's wake, cursing yourself and the car. And now imagine eating a rocky road bar ~ the first bite, a big mouthful, all that butter and chocolate flooding your mouth, the next instant the crunch from the nuts, the chewy, soft marshmallows, mellow, yet still identifiable. A pleasurable experience. Now if you put these two experiences side by side, which one would you prefer? I am sure the later. 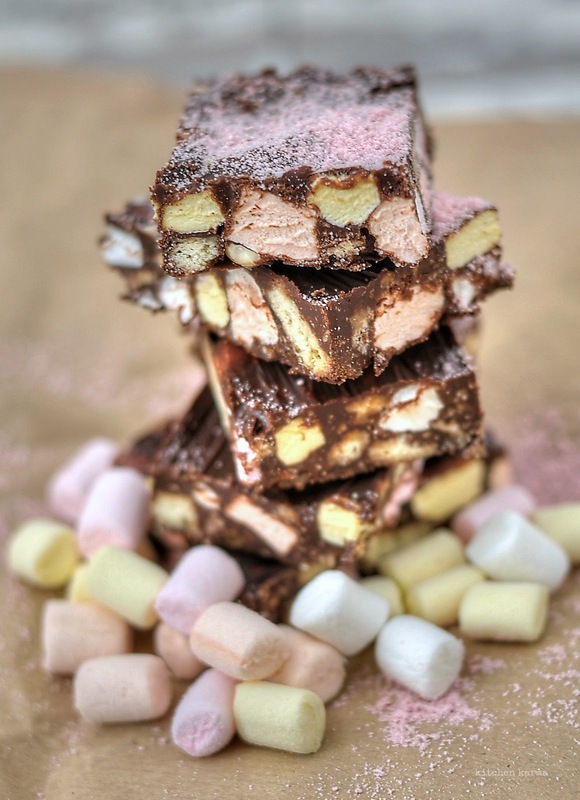 Who knew a dessert named rocky road would be so much fun to eat. And the good news is that they are easy to make. There's hardly any cooking involved, you just have to be patient and let the fridge set it. 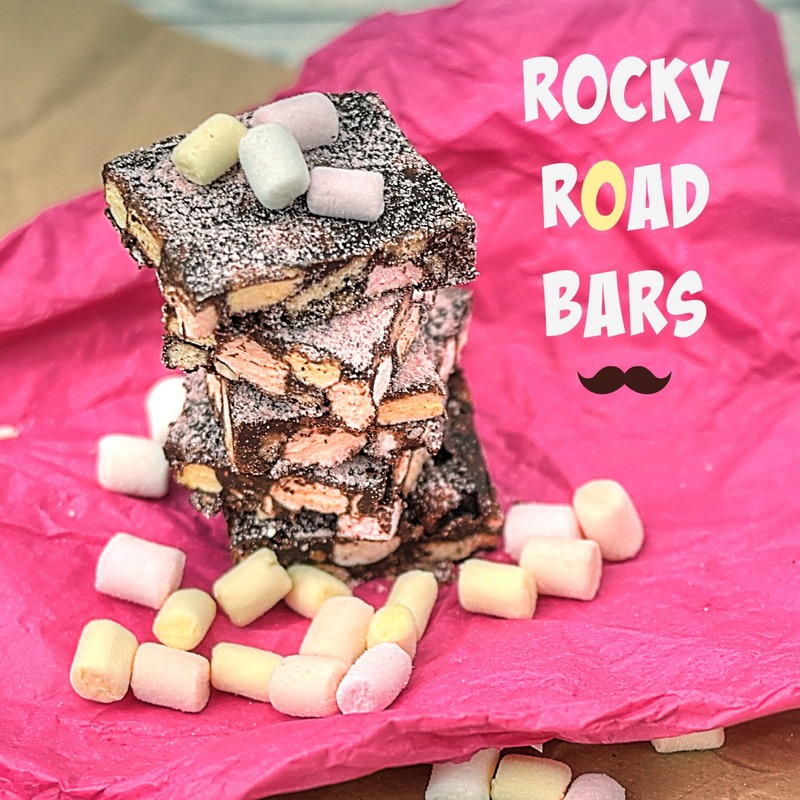 The reason I mentioned the rocky road car ride, is cos when I first heard of the name, I was pretty intrigued about it. Imagine calling a sweet after rocky roads, which let's face it is not the most comfortable experience, all things considered. So I read up about it a little, rocky road, the sweet, has it's own wiki page and different countries have their different recipes. Apparently this flavour was first discovered for ice cream during the Great Depression of 1929 in America and it's inventor (who it was is a bit controversial, so I am not taking any names) called it rocky road after the difficult times they were in. Both the name and the taste seemed to have a hit the right spot and soon from ice cream flavour it became a full dessert in it's own right. There is something about these bars which is pretty addictive. I first had them when my friend Vinee made them for us for part of our Christmas gift swap. Ever since I have been meaning to make them. Recently I sent my family a small parcel. Decided to make some rocky road bars for the parcel. They loved these as much as me. 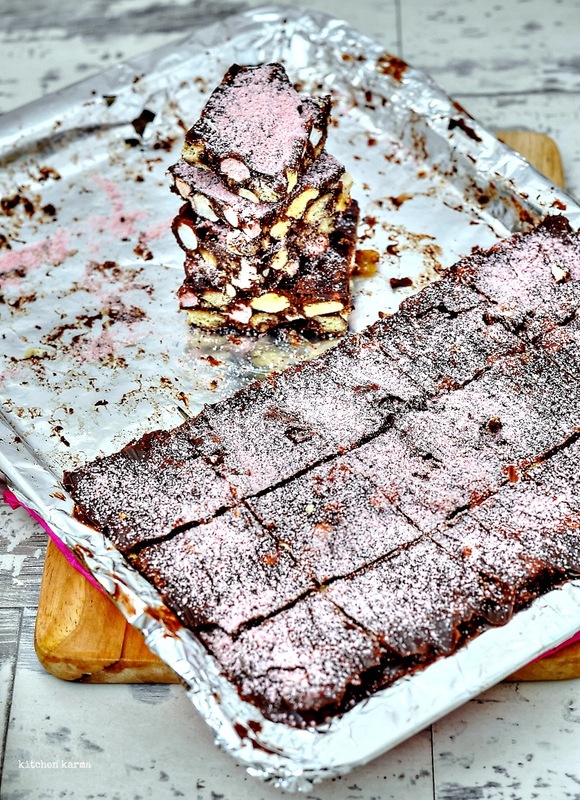 Also now that summer is coming and UK is celebrating picnic week these rocky road bars make excellent picnic food. Let's crack on with the bars. I followed my friend Vinee's recipe, she adapted her's from Nigella Lawson's. viii. Icing sugar for dusting, I coloured my icing sugar pink to make it a little kitschy. 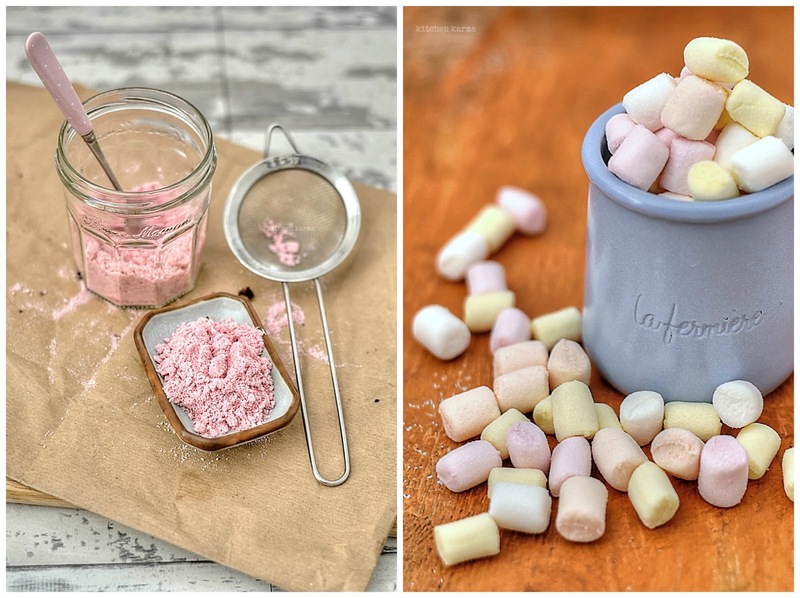 What I did was in a clear plastic bag took half a cup of granulated sugar, added one drop of edible pink colour, mixed the sugar well, till all the granules had turned pink. Then spread the sugar on the plate and kept in a dry place for the granules to dry out. After half an hour or so, I blitz the sugar and turned it into icing sugar. i. In the same plastic bag in which you coloured your icing sugar, place the tea biscuits and bash them roughly with a rolling pin. Make sure to leave some chunks to bite into. ii. In a microwave safe big bowl, melt the chocolate. The way I do it is first I roughly chop the chocolate, then place the bowl for 30 seconds in full powder. Bring out the bowl and use a spatula to stir the melting chocolates. The more you stir, the more the chocolate you will in the action. Then I use the microwave for 10 seconds, while stirring in between till my chocolate is a smooth semi liquid paste. Halfway through this stage, add the butter and the Golden Syrup and keep stirring till everything makes a smooth paste. Don't over melt the mixture, you may have to throw out the entire thing then. You could do this on stove top too, but I find chocolate much more fuss free to melt in the microwave. iii. Save half cup or 125 ml of this mixture for later. iv. Slowly add the rest of the ingredients to the bowl~ the marshmallows, biscuit, cashew nuts and raisins and mix everything well. The crumbs from the biscuit will make the mixture grainy, don't worry about that. v. Cover your baking tray with foil and transfer the mixture, spreading it as evenly as possible. You may need to move quickly at this stage, since the mixture will start to harden. vi. If needed heat the remaining chocolate mixture for 5 seconds or so to loosen it slightly before pouring in over the mixture on the tray. vii. Once done, cover this with a cling film and using a rolling pin, gently smoothen the mixture. viii. Put the tin covered in cling film in the fridge to set. I kept it overnight. ix. Next day carefully take off the cling film, dust with the coloured icing sugar and slice the pieces. They stay for a week in an airtight box in the fridge, and they travel pretty well securely wrapped in several layers of cling film. Just keep them in the fridge for a couple of hours before unwrapping them. This is so yummy. I wish I could make it just as pro as you are. Amazingg.